Police officer Justin Roby showed up on a routine shoplifting call. But instead of taking the man to jail, Roby extended a helping hand. As soon as Officer Justin Roby stepped into Kroger, he saw that this was in fact, not a typical shoplifter. It was a man caught in a moment of despair. Then the officer Justin Roby turned around and did something else shocking. He bought some more cans of formula for the single father. To Roby, what he did was not that big of a deal. It was simply what needed to be done. 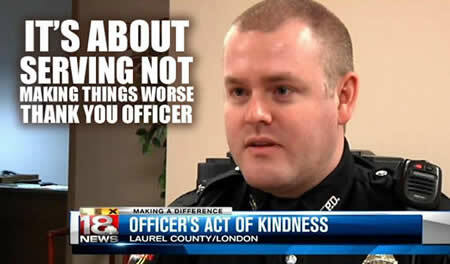 We don’t always hire police officers who have the ability to think this way. When police feel above the law its like saying “we’re better”. No different than police illegally parking for lunch, speeding to work or other disrespects for the law. Laws are tools, there is a term called “the spirit of the law” in which a law is to be used as a tool. The other problem here is media often decides which story will be made public. This story while it has merit should not be made special, it should be common which means its not really news. In a bad way it exposes the fact police may not always do the right thing. Many don’t care, have no empathy (which is a social-path tendency).